Baltimore City Parks have a special place in my heart. As a West Baltimore native, I spent hours of my childhood playing in the Gywnn’s Falls/Leakin Park woodlands. We had a tennis court where I pretended to be Martina Navratilova. We had the Carrie Murray Nature Center (I swore it was haunted). We had streams and waterways where I lost my action figures and hills where I raced my siblings and my friends. I was always sad for my friends living in East Baltimore because, to my knowledge, they didn’t have parks. Now I know better. Over the years, it has been strange to witness the investment in certain parts of East Baltimore while watching the upper corridor of West Baltimore ignored. Relegated to that area of town where some neighborhoods look like vacated war zones, Baltimoreans often forget about the majestic old homes with large porches and oak tree canopies. They also forget about Gwyn’s Falls and Leakin Park. Thankfully artist and environmentalist are bringing attention to these often overlooked places. Running from May 2012- October 2012,Nature Art in the Park- The Nature of Change is the second annual summer-long series of exhibitions, workshops & other family-friendly Nature Art events in an ongoing collaborative project bringing together site-specific works built from natural materials, in the forests of Baltimore City’s Parks. Marshall Clarke’s portraits of Marian House alumnae adorned the Cork Gallery walls. Close to 100 people packed the Cork Gallery on a sweltering June afternoon for the release of a remarkable book of photographs and stories about Baltimore women who have transformed their lives. 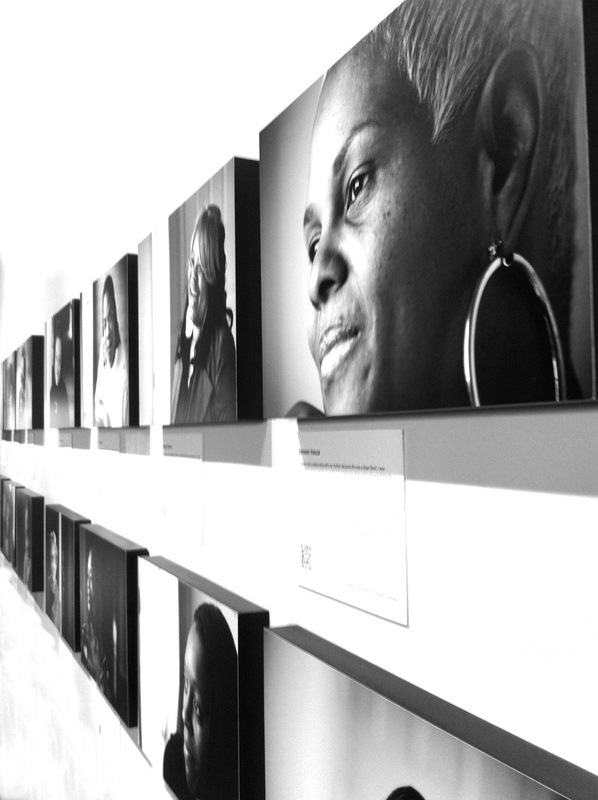 Through prose vignettes and portraits by local photographer Marshall Clarke, 30 Women, 30 Stories: Journeys of Recovery and Transformation profiles alumnae of the nonprofit housing program Marian House, which marks its third decade of operations this year. Since opening its doors to 16 women on April 12, 1982, Marian House has helped over 1,000 women tread the difficult path from hardship to recovery. The organization plans to use the book and related media to raise awareness and spark conversation about issues of addiction, incarceration, homelessness, mental illness, and trauma. Marian House executive director Katie Allston engaged artist Peter Bruun to spearhead the book project, which was funded by grants from from the Open Society Institute-Baltimore, the TKF Foundation, and the David and Barbara B. Hirschhorn Foundation. Bruun worked with Marian House staff, clients, and alumnae to tell the women’s stories using a wide range of media and disciplines. 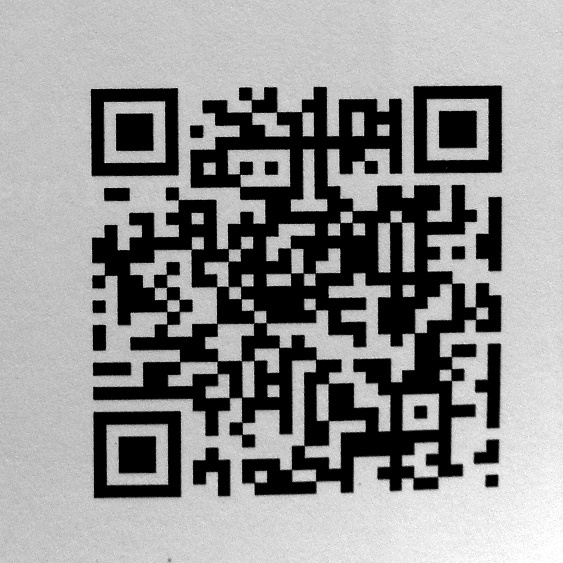 The exhibit incorporated multimedia elements, including QR codes like this one. The June 21 release event offered an impressively rich and well-integrated multimedia experience. Photographs of each woman profiled in the book adorned the walls, paired with quotes and QR codes leading to the Marian House website, where attendees could listen to recordings of the women telling their stories in their own voices. Guests also had the option of taking a cell phone tour of the exhibit. On one wall of the gallery hung a quilt created by four Marian House residents and a local textile artist. On another, a resident-created painting inspired by the book project shared space with portraits of the women taken by local photographer Marshall Clarke. A DVD and forthcoming touring exhibition of Clarke’s photographs are aimed at introducing Marian House to a wider audience, including policymakers and advocates. Bruun explains that the collaborative, multi-dimensional nature of the project is designed to engage a diverse following. 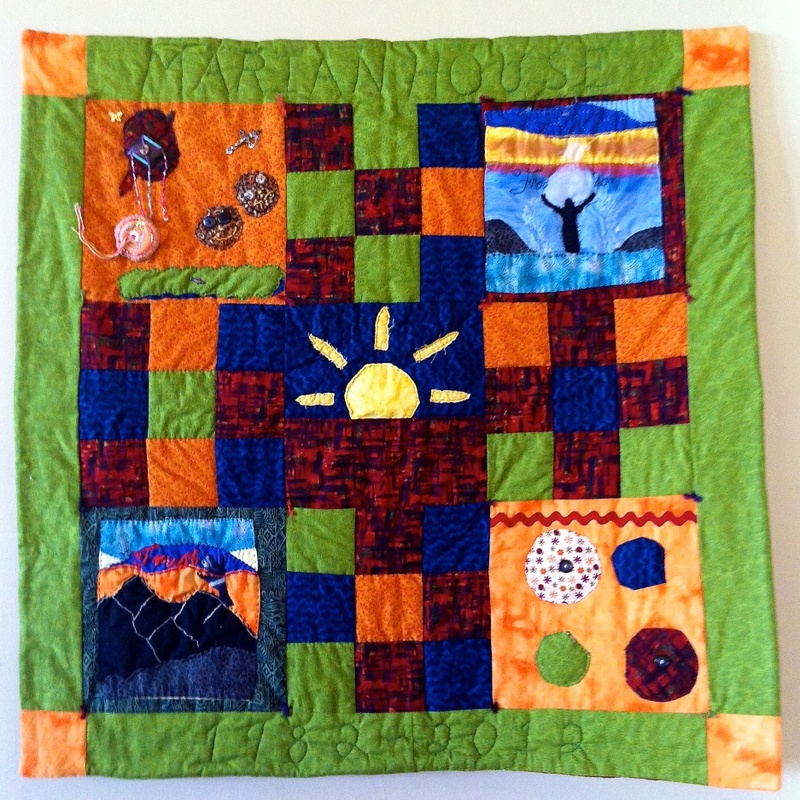 A quilt designed by Marian House residents. For all the visual, audio, and online elements that comprised the exhibit, the focus of the June 21 event was the Marian House graduates and their personal journeys. Two of the women profiled in the book took the microphone to share their stories, which were emblematic of the struggles and triumphs experienced by all of Marian House’s residents and graduates. Baltimore is getting ready to “Face Race” this Fall and it is about time! I do not trust artists, activists or services providers who do not have a track record of addressing issues of race in their practice. Race impacts everything I do. It impacts my decision to attend a theater performance on the east side of Baltimore. It influences my decision to involve myself in the myriad of activist movements in town. I’m not the only one who thinks about race all of the time, am I? How do we as artists, activists, funders, researchers and service providers keep the impact of race in the forefront of our practice? I do not know. 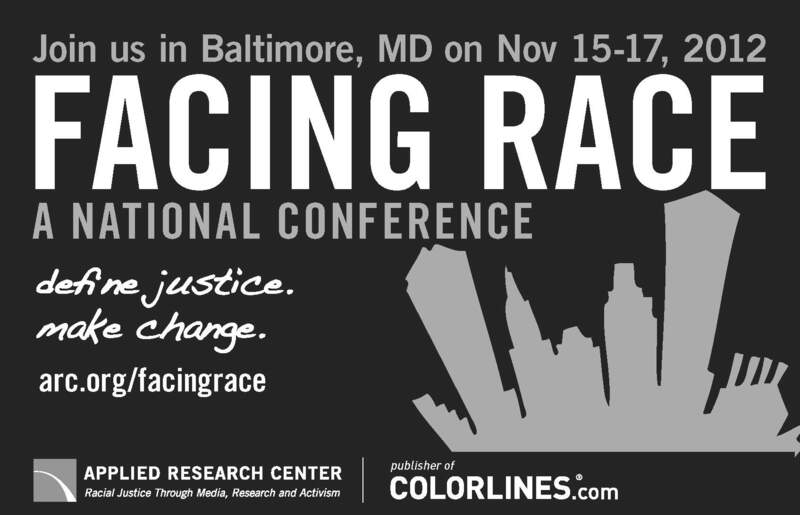 Thankfully this fall, Facing Race 2012 is coming to Baltimore, November 15-17 to help us figure it out. If you are anything like me, you are going to want to hit this event up. Facing Race is a conference like no other – it is the largest national, multi-racial gathering of leaders, educators, journalists, artists, and activists on racial justice. Facing Race conference sessions will address topics such as 2012 election, economy, arts & culture, education reform, multiracial organizing, immigrant rights, and the development of racial justice leadership and training models. Workshops offer attendees a chance to develop hands-on strategies for positive social change. 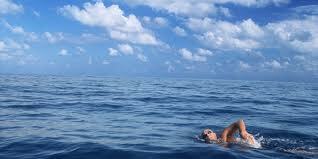 As anyone who has ever emigrated can attest, dropping into a new place is like learning to swim. It takes you a while to figure out a) what this water “thing” is, b) how to not drown, c) how to transport yourself through the water, and finally d) how to thrive in the water like Michael Phelps. After you’ve earned your eight gold medals, you suddenly learn you’re not in a swimming pool at all, you’re actually in a great lake, and you repeat the cycle from the beginning. Then, years after that, when you think you’re reaching the lake’s shore, it becomes apparent that you’re actually swimming in an ocean. In 2006, when I arrived in humid, humid Baltimore from dry, dry Colorado, I was very aware of one thing: I was a transplant. Luckily, I had a purpose in Baltimore; to set up shop for Single Carrot Theatre. I also had a teammate–my then-girlfriend and now-wife, Giti; and I had a sister who lived in Fells Point with a futon available at low rent. Every city has its treasures and its problems. The problems in Baltimore were far different than those I’d left behind in Colorado. Or perhaps they felt bigger. Or maybe since I was becoming an adult, having successfully escaped intact from the insular bubble of college, the problems were just more immediate. My first week in Baltimore, someone drew a map for me and said, “within these lines, you’ll be safe”. I drew that identical map many more times over the next two years as my compatriots in Single Carrot moved to Baltimore. However, it was soon apparent to me that I’d left the bubble of college for a similar bubble of the Charles Street corridor. How was I going to expand my map? After years of living in this very difficult-to-define city (to those in the north, it is the south; and to those in the south, it is the north), I have begun to appreciate the many layers of Baltimore and the place I occupy as a transplant. Learning Baltimore is a long process that I am far from completing. Sometimes I’ll spend months at a stretch in the company of other transplants, and then I’ll meet artists who were born and raised in Baltimore. The Baltimore-born often carry hometown pride, but there’s sometimes a chip on the shoulder, too. To me, it feels like I live in an entirely different Baltimore than Baltimore-born folks. Drop the “B” and you’re left with your own private “altimore”. But how many “altimores” can there be? I hear transplants praising other transplants with statements like, “They come in with energy and a desire to make things happen.” How do Baltimore-born people feel about transplants? In my own case, I feel a little bit like a carpetbagger. Baltimore, a place where many residents experience a daily struggle for the basics, is a place of great potential for me. The non-monetary resources are here–there’s a welcoming arts community, there are a few seed grants to get artists going, there is an abundance of space, and people won’t typically oppose unusual ideas–in fact, they may even go out of their way to support those ideas. I used to say that the American dream was alive and well in Baltimore, but then I realized that perhaps the American dream is more easily achieved by a white male from Colorado who was given a car by his parents when he graduated debt-free (thanks again, parents) from his state university. One thing is clear. Almost six years later, I am still solidly a transplant.